Generally there are so many varieties of fibres made from naturally occurring polymer cellulose which is obtaining in all plants. Viscose is described by BISFA as the creature of “a cellulose fibre acquired by the viscose making procedure”. It is known as rayon fibre in United States of America. In 19th century, many varieties of cellulose fibres has been made experimentally… the most well-liked cellulose fibre produced in 1905 is viscose fibre. Normally cellulose from wood is used to make the fibres for fabris but sometimes cellulose from short cotton fibres named linters can also be used. By the way, the most common cellulosic fibre is Viscose fibre. Viscose fibre is developed from a grouping of natural and man-made constituents and it can be made into the more ordinary form of rayon, it is used in several kinds of textile materials such as clothing, upholstery…..
• Viscose can be used very little in home furnishing fabrics but in the industrial field, it is the main product used in European market to redevelop rapid tyres because of its thermal stability. • Viscose can crease easily and minimize in its size when introduced in hot water. • Viscose has a good drape-ability property. Viscose fibres are prepared from cellulose from wood pulp. Wood pulp cellulose are reacted with caustic soda, after a matured waiting period of time, the developing process will takes place. During that time, depolymerisation occurs and carbon disulphide will be added. It forms a yellow crumb, called as Xanthate which can be easily dissolved in more caustic soda to give a viscous yellow solution. Viscous yellow solution is then forced through a spinneret that may hold thousands of pores, into a dilute sulphuric acid soak where the cellulose material is redeveloped as s fine filaments as the yellow crumb, xanthate decomposes. 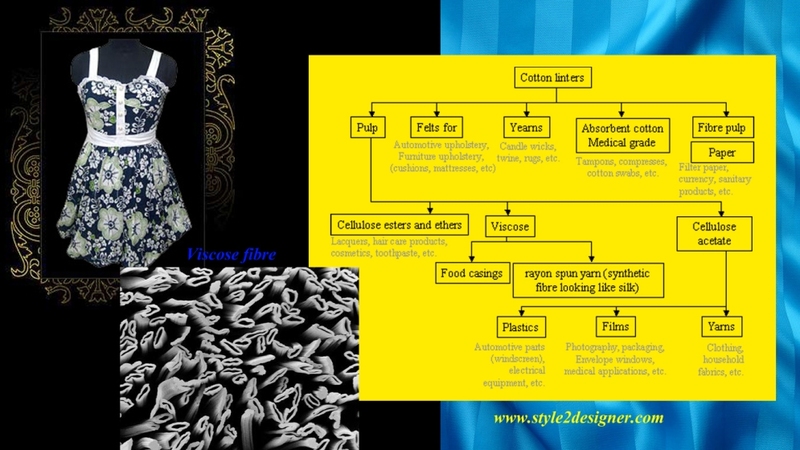 I wanted to know why viscose is used for medical dressings.